Cleaning your gutters is an unpleasant, time consuming and potentially dangerous chore. Many people submit themselves to unnecessary risks because they don’t have the right equipment, and they choose the wrong time to clean their gutters. The simple truth is that you shouldn’t be cleaning your gutters yourself, just like you shouldn’t attempt to repair your electric panel. Aside from it being dangerous, it is unpleasant, and it can also be inefficient if you don’t do it right. Most people choose to clean their gutters by themselves because they want to save money. But there’s a better alternative… keep reading to find out. Gutter guards or leaf guards are systems designed to protect your eavestrough from fallen leaves while allowing the water in. This system was invented to protect you from submitting yourself to a dangerous and sometimes almost impossible chore while allowing you to save money. 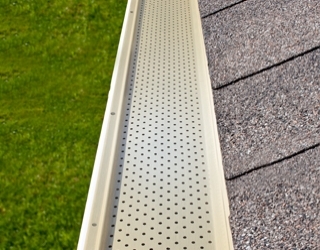 A leaf guard fills your gutter opening entirely so that nothing but rain can get in. With this system installed your gutters will need less maintenance, and you will be able to admire the reddish – brown spectacle of a beautiful autumn day without worrying about your eavestrough. There are many benefits to using a gutter guard. Besides the obvious advantage of protecting your gutters from leaves and dirt, leaf guards are quick and easy to install without damaging the shingles. They also offer permanent weather protection all year-round for the material is resistant to heat and cold. If you are worried about the look, then you should know that gutter guards are invisible from the ground. Another great thing about this system is that you don’t have to clean it. The material is self-cleaning, and it doesn’t absorb water. Gut-R-Dun is specialized in exterior services. We use only high-quality materials from premium suppliers so that you benefit from excellent services. If you want to avoid spending an arm and a leg on gutter repairs and maintenance, contact us and we will install leaf guard to your eavestrough. This way, you will end up saving a lot of money in the long term, and you will also eliminate one of the most unpleasant chores from your life. Stop spending hours to clean your gutters!